Bring your website to where your customers are with responsive web design. Web Design Corp specializes in responsive design to give your customers a great viewing experience no matter what devices they access your page on. With our dedicated team of skilled designers your responsive website will be able to reach more customers, improve page ranking and much more. If you have ever accessed a website on your phone or other mobile device and were greeted by jumbled graphics, hard to read text or a page that simply would not fit on your screen then you know why responsive design is important. Years ago, when the internet was new and the most exciting thing our phones could do was play that snake game, websites only had to fit one screen – your personal computer’s. This meant all designs were created with that screen format in mind. Now, with people carrying phones that are more powerful than most personal computers, websites need to be tailored to our new viewing habits. Responsive design is a specialized way of creating websites, so graphics, texts and layout will fit on a wide range of devices and screen sizes. 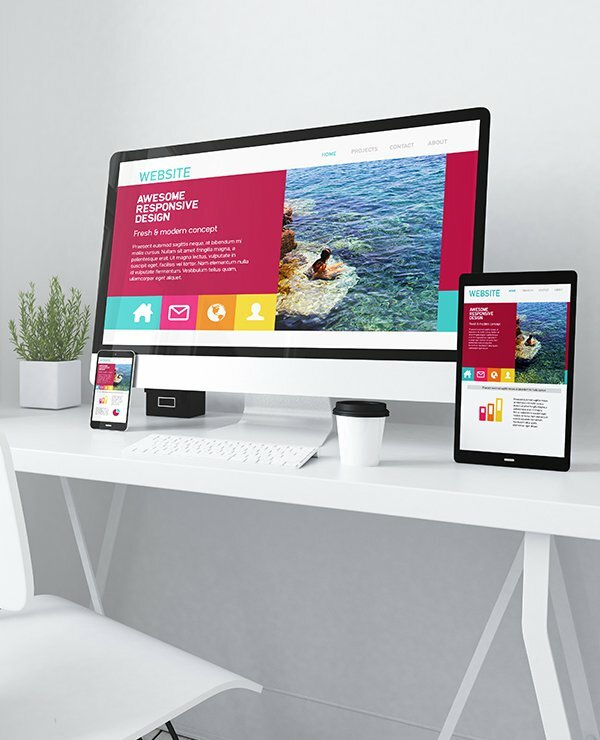 With responsive design, you can ensure your customers see your website’s best self no matter if they’re viewing your site from a computer, phone, tablet or any other mobile device. Because people are using their phones for searching more than ever before, having a mobile-friendly site is crucial to meeting your customers’ needs. A responsive website will help you tap into a customer base right in your area. Similarly, a responsive website will improve local search rankings because it can be easily accessed in your area. Because an optimized and responsive website will load more quickly, this will decrease high bounce rates. Google has been steadily increasing the pressure for mobile-friendly sites and now, as of 2018, they will use mobile sites, not desktop versions, to determine rankings. While some companies do choose to have a separate mobile app versus a responsive website, having a single responsive design takes less time and requires less maintenance – further saving you money. Fast page loading times are critical for keeping your customers engaged with your website. When your site is properly formatted to fit a screen, it will take less time to load. Not only will this increase the chances of your customers staying on the page, your SERP ranking may also be helped. At Web Design Corp, our responsive design team has the experience and certification necessary to create an effective, responsive website for you. We employ results driven methods and techniques to ensure you get a site that creates a better user experience without sacrificing functionality or your company’s design aesthetics. Reach local customers and lower development costs with effective, responsive website design.